On Wednesday Alex Jones crashed the Senate Intelligence hearing on foreign influence on US social media platforms. The US House is holding a hearing later today on tech giant censorship of conservative voices. In August Facebook, Apple, Google-YouTube and Spotify colluded to eliminate Alex Jones and Infowars from their platforms. 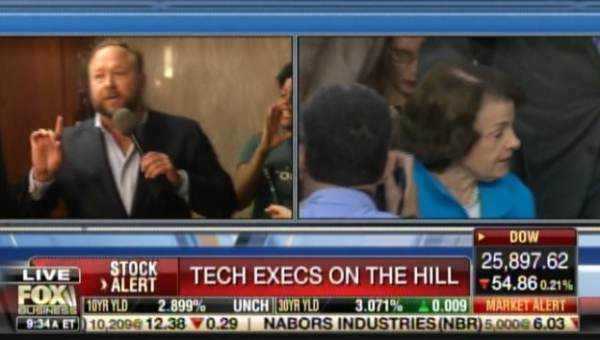 Alex Jones showed up outside the Senate hearing. Tech giants Google and Twitter will testify today before Congress. This morning the US Senate is holding a hearing. Gateway Pundit reporter Cassandra Fairbanks is there. Alex asked Senator Rubio about social media censorship of conservatives. Marco Rubio told Alex Jones his concern was about foreign influence in the US elections. This was a stunning video.